These are the three characters that I created for my animation class. I drew these characters because they are different things that look interesting to me an that are creative. I wanted to draw something that I may one day use in an animation. Also something that is interesting to people that see them. 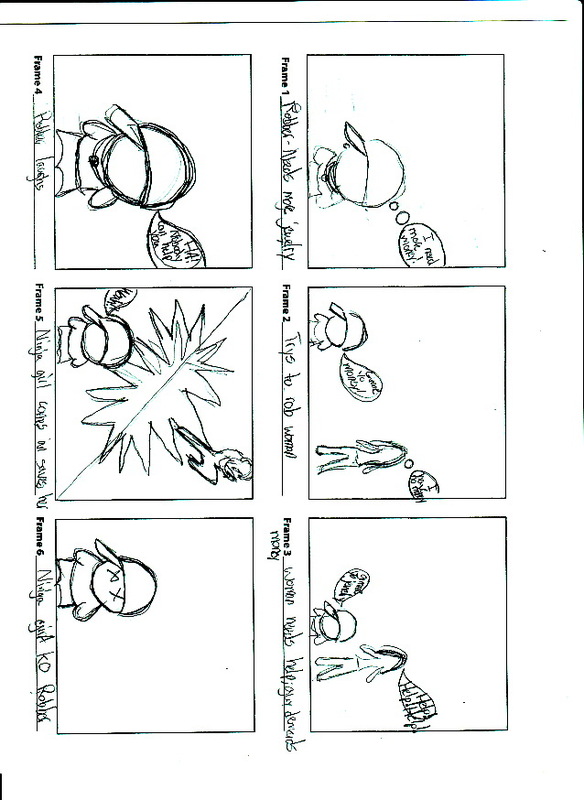 This is a story board for my upcoming animation. The animation is going to be done in flash. For my story board I made a quick sketch of what I wanted in my animation. I used simple drawings to create the story for my animation. These are five of the character that I created on the computer using different sites. I liked the characters I created because they are interesting and all have a theme. I made three m&m characters and two other characters. I think they all can be used in an animation. I have many favorite characters from classic cartoons like Popeye, Buggs Bunny, Road Runner, and Thundercats to anime like Dragonball Z, Naruto, and Kung fu panda. I see anime as the future of cartoons but I always like the classic cartoons like Tom&Jerry that were simple but still entertained. Its hard for me to choose between all of the different characters that I’ve seen but i think my favorite cartoon character is the characters of Thundercats. I like these characters the best because it was different variations and they all were creative yet it was easy to tell that they were a part of the same cartoon. Thats why the Thundercats is my favorite cartoon characters. This is music that I created in GarageBand. I used different sound and instruments to create the music and the sound that I liked. This is one of my favorite things to do whenever I get A chance. This is my animation project. I choose to do a project that changed as the animation progressed. I think my animation is interesting and keeps your attention. Hope you enjoy.